It’s been years since the UN allowed the world to murder Libya. The question is still: “Why did Russia and China abstain from the vote in the Security Council that ended by murdering millions of people and totally destroying Libya”? If just one of the five members of the Security Council had voted against the resolution to attack Libya, that resolution would have been killed outright, but instead thousands of people are still dying in so many places that are no longer countries. These questions need answers that the rest of planet can finally understand. So how about it Russia? How about it China? Why did you both fail to protect Libya from the slaughter that followed? 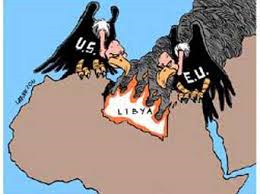 Did you really want to curry favor with the West so much that you were willing to throw Libya to the wolves to get the criminal approval of the UN, EU USI and Israel? For that matter why did the United States feel that it was suddenly necessary to murder Gaddafi, another of its’ supposed allies: Given that all which remains inside Libya is scorched earth ruins and conflicted armies of bandits with no laws and no leadership at all. Cameron, the US puppet in the UK that has his entire face so far up the posterior of USI that he has become the obscenity who claimed at the time: “The US attack was required to “PROTECT” the people of Libya from an out of control dictator”. The question for Cameron is: “What happened to the people that lived in Libya at the time that his gloriously longed for slaughter wiped out that country entirely? Where’s the global benefit from the mass murder of millions and the total destruction that you were all cheering so loudly for: Before Libya was removed from the community of nations and its surviving people scattered to the four winds? If any of the criminal nations and their pretend puppets who advocated for this global-crime against Libya, could have seen into the future—would anyone have done anything any differently? I doubt it because that was the USI-Israeli plan all along. The World According to Cameron Combat Mode: http://rt.com/shows/in-the-now-summary/235543-cameron-military-ukraine-putin/ Watch the first 2min of the video. There is of course one other glaring fact that no one has bothered to explore yet. If the all-powerful West really wants peace anywhere in the world today: Then why in hell are they (the oligarchs, the banks, the EU, NATO, USI and Israel) not sending aid in the form of rebuilding and resupplying all the many, many nations, of the world that they’ve been laying siege to; supposedly in the name of creating a better world for people everywhere? 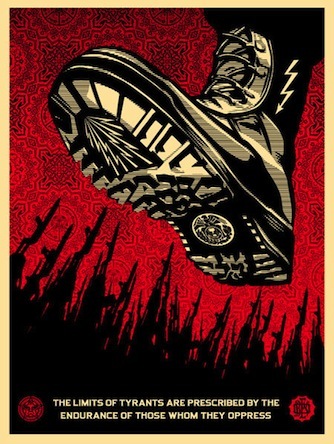 They can’t have this both ways ­ either they are slaughtering people to genocide them or they’re actually interested in setting people free and giving them the supposed democracy that there is no evidence of anywhere their boots have tread since the new millennium began! CASE IN POINT ­ Why not rebuild and resupply Ukraine instead of rearming it?